North Star Critical Care LLC was established by Christine and Lee Lerussi of St Clair Township. 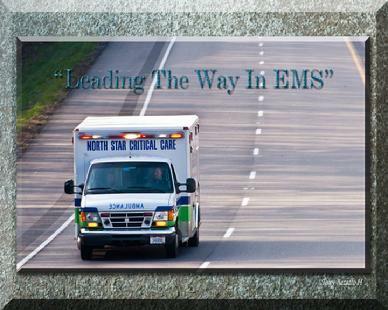 We were licensed by the State of Ohio Division of EMS, Public Safety in March 2007. Christine and Lee are life long area residents and have over 40 years of combined public service to the community. Our dedication is to the health and safety of our community. Our staff is comprised of highly professional and caring members of our own community. The staff consist of In-House billing specialist, Dispatchers and EMS crews that are dedicated to our community and are passionate about their profession. North Star welcomes all levels of providers to our team.